Mulle got a hint from a user named tilliamable. The hint contained a link to a YouTube video where Chris Hülsbeck, sound king of “The Great Giana Sisters”, has been interviewed. The interview is fully in German and he mainly answers the questions about why a female hero and where the idea for the soundtrack came from. He also mentions that there will be an official iPhone version. With official it means that you will have to pay money for it. 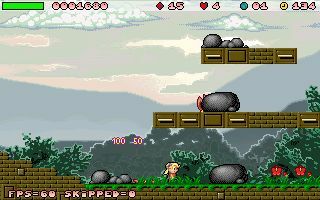 Armin Gessert, the coder of “The Great Giana Sisters” died of a heart attack last Sunday (8th November 2009). It’s a really sad day and many of us will miss his genius mind. People may say “The Great Giana Sisters” is a Mario rip-off, who cares – fact is this game brought many of us a great time! Thank you Armin! Thank you forever! We will try to make Giana’s Return even better, to show our appreciation! leider habe ich eine sehr traurige Nachricht zu verkünden: Armin Gessert ist in der Nacht von Samstag auf Sonntag völlig unerwartet, auch für alle die ihm nahe standen, an einem Herzinfarkt gestorben. Kondolenzbekundungen, die mir zugeschickt werden, werde ich an seine Familie weiterleiten. Slaanesh has been helping out porting Giana’s Return to Dingoo Linux (Dingux). The port is suffering from “segment faults” once you jump into a bonus cave. Today we probably have tracked down this bug, but we still need to fix and test things. If this was indeed the problem, a Dingux version could appear the next three weeks. Giana’s Return GP2x v0.99.6 (Hotfix) released! The original v0.99.6 release was not able to work on GP2x machines with NATIVE firmware, this is a hotfix release. Giana’s Return GP2x now works on NATIVE Firmware and Open2x Firmware. As usual, thanks to Pickle for the hard work and thanks to everyone who was hinting us! We’ve been moving to a new server and everything should be working again! More news soon. It came to our attention once again, that “The Great Giana Sisters” are having an official commercial Windows appearance. 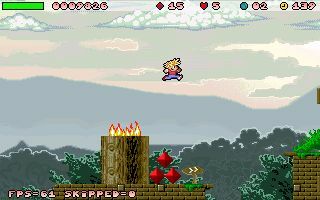 The remake of the classic should feature all 32 original levels, a remixed soundtrack by Chris Hülsbeck himself and a level editor. As the Giana’s Return Team has decided to NOT make the level editor public, this might be a good, but not free, way to go. The release seemed to be scheduled for around December 2009, publisher is BHV Software. Several online shops had the game listed or still list it. The project manager of Giana’s Return, who also updates this webpage most of the time, is on vacation in China. Some user expirience problems with the GP2x release. Something like “Giana’s Return” does not work on my GP2x-F100 does not really help, please let us know your MODEL (F100 First Edition, F100 Regular Edition or F200) PLUS if you use native Firmware or Open2x along with it’s version number. Only this information will allow us to track the problem down! Some of you might be happy to read, that we have a first prototype running on Dreamcast. Thanks to Indiket for his marvellous work!